The SWN E-Club is for those quilters who are unable to meet at the shop. Patterns & starter packs/kits are mailed to you monthly. 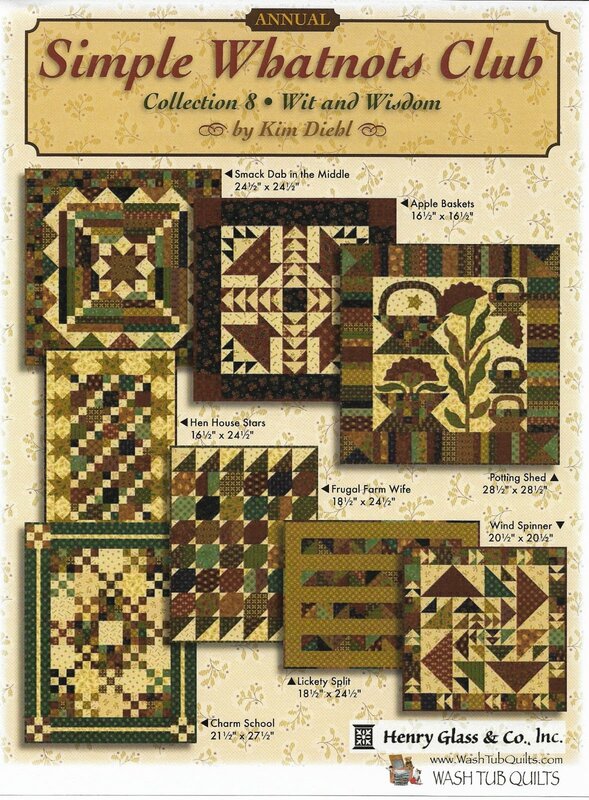 The Simple Whatnots E-Club 8 will feature Kim's next fabric collection "Wit & Wisdom" and begins in February 2019 and runs through Nov 2019. Club 8 will feature eight charming little projects from Kim Diehl. Most of the projects will be patchwork with a few projects offering applique. In addition, there will be some extra projects from Kim and some Nickel Nonsense from WashTub Quilts. We know December is a busy month with the holidays. So, there will be no mailing, but we will send you a digital pattern for a holiday table runner, with the option to purchase a kit. We all have some stash and the Simple Whatnots Club at WashTub Quilts is designed so you can use that stash. But, kits will also be available for those who don't have a stash or would just prefer kits. Each month (except December) you will receive the pattern and a starter pack of fabric. 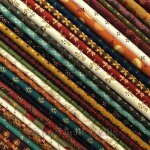 Depending on the project, the starter pack of fabric will include 8 Chubbs (9" x 11") from the Wit & Wisdom fabric collection and a neutral FQ from one of Kim's fabric collections. Depending on the project, we may substitute 4 F8's (9" x 22") for the chubbs and a neutral FQ. The starter pack will give you a start on the quilt -- you will need additional fabric from your stash to complete the quilt top. Yardage requirements for these quilts frequently include fat quarters, fat eighths, and chubbs with additional yardage for the borders, binding and background. Of course, there will be kits available and details will be available at the end of December. Each month we will also offer a special on the backing for that month's project and it can be included with your monthly mailing to save you shipping! How simple is that? ** There is a non-refundable registration fee of $ 15.00 that will be payable when you sign up. ** The monthly fee is $ 20.00 for 10 months (Feb 2019 - November 2019). There is an option of a single non-refundable payment of $ 180.00 giving you one month free and no registration fee! If you opt for the single payment, your patterns and starter packs will still be sent on a monthly basis. We will only invoice you when you pre-order a kit. Remember, the Simple Whatnots Club will earn you "Thank You Rewards" However, if you default on a BOM/Club program you will forfeit all your reward points you have accumulated and you will no longer be eligible to earn "Thank You" rewards. If shipping is added to this item, we will remove the shipping cost before we capture the funds. Please contact us if you have any questions..
*International Quilters - please contact us with your mailing address and we will let you know what the additional shipping cost will be.